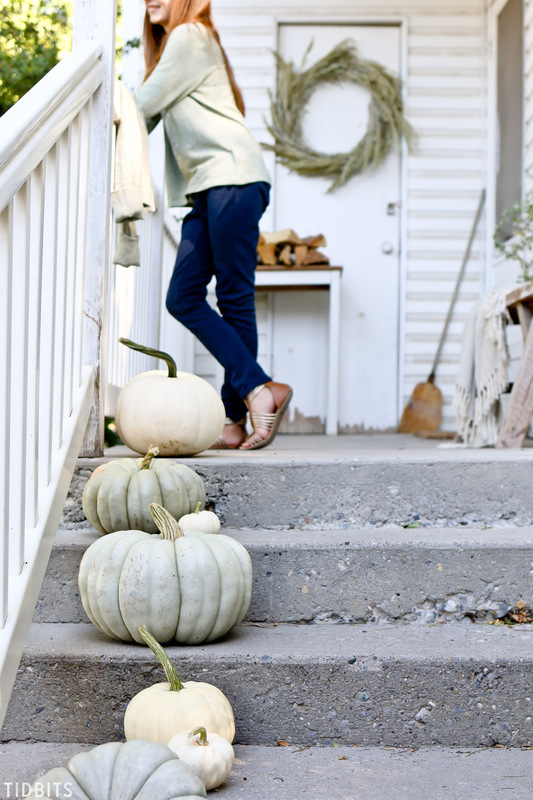 Fall should always start at the front porch! 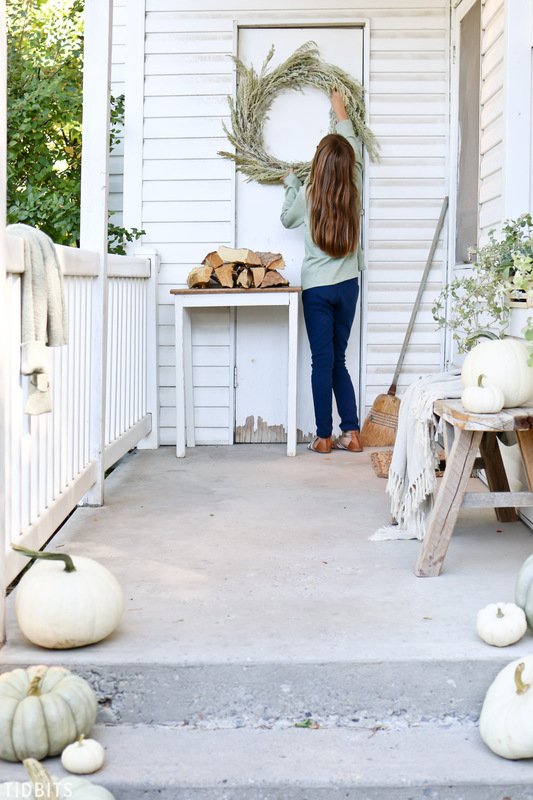 Inspired by the color sage green and white (of course), I’ve decorated the outdoor entry of this 100+ year old home – welcome to this cozy Fall Front Porch, in all its charm! I have decided I may have missed my calling in life. I’m putting out a new advertisement . . . 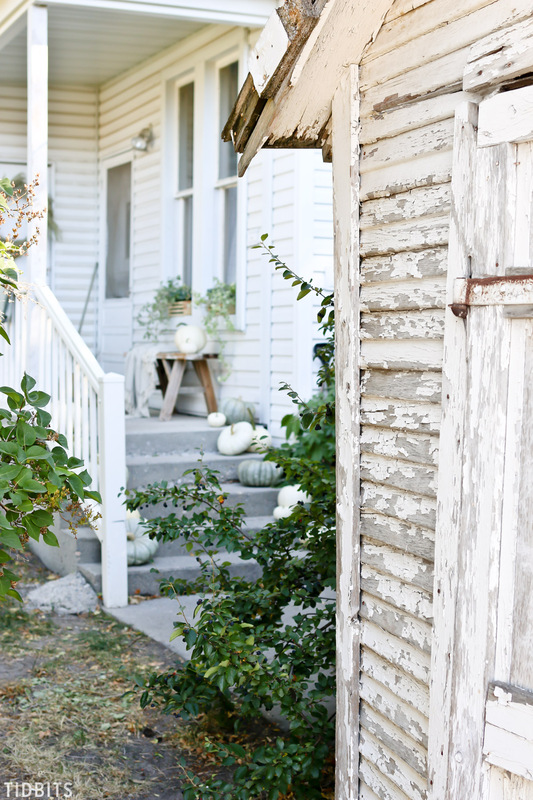 Nothing can truly replicate the charm and character of old homes – however much we try. I’ve sat the last 5 months admiring my neighbors old home from our rental house, wishing and dreaming I could get my hands on just a tiny piece of it. Since my mama taught us to always go after what we wanted – I’ve got a story to tell. It may make you feel awkward and uncomfortable for me (judging by my husbands response to my story), but no worries – definitely a happy ending! 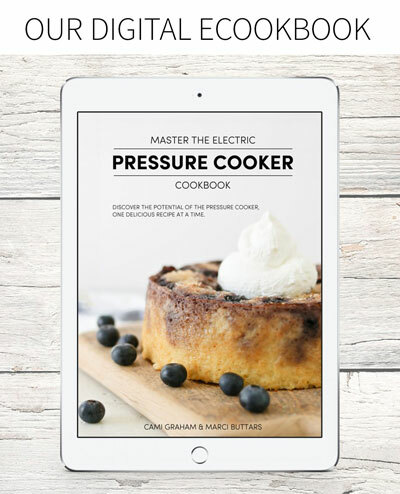 Once upon a bloggy blogging day, an exciting email came my way . . . 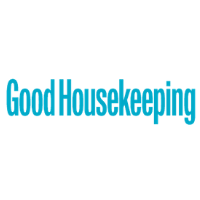 It was an email from a dear friend, Krista, from The Happy Housie. 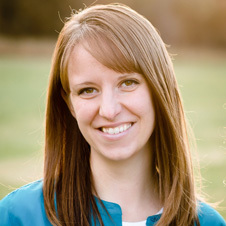 She hosts and organizes some killer blog hops, where she gathers incredible talent on the world wide web, to share all sorts of inspiring seasonal content with each other and our readers. 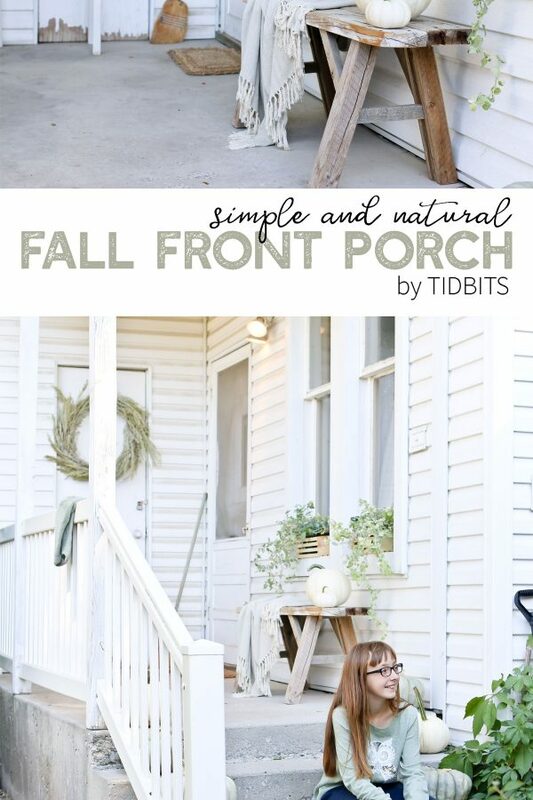 Since I can’t resist a good blog hop, I signed up for the Fall Front Porch series (among others). But that old home across the way . . . 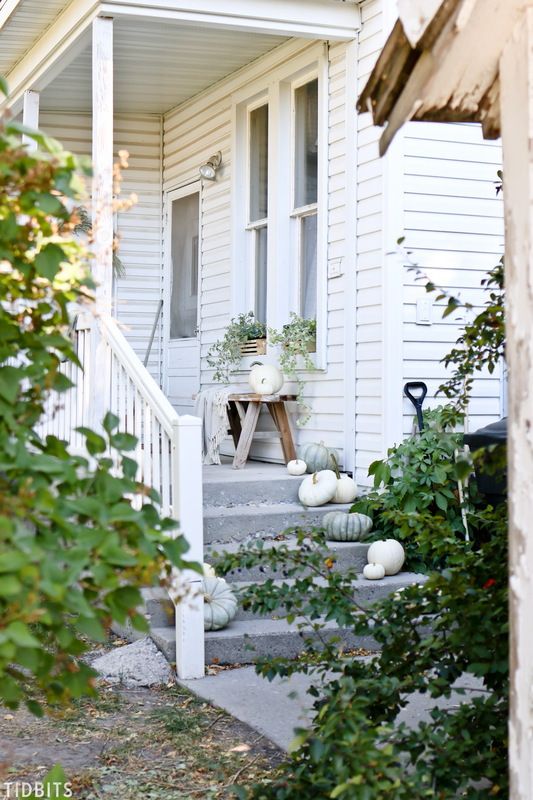 I knew how dreamy it would look with pumpkins spilling down those old cracking stairs. One minor problem – I had no idea who lived there. 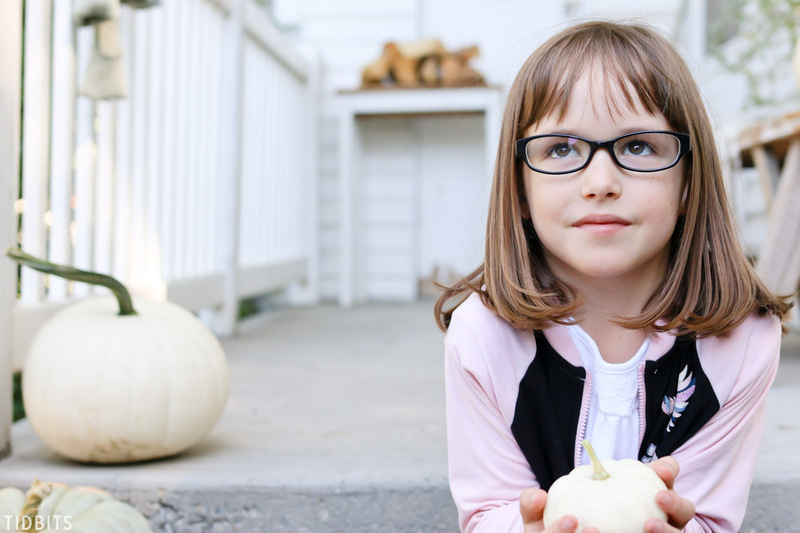 My kids had caught a few glimpses of a lady, but I had yet to see her surface. Alas, bound by determination and desire, I marched on over to her charming porch, knocked on the door . . . knocked again . . . and again . . . and . . . Finally, a little lady slowly opened her door, leaving the screen shut. “Hi! My name is Cami. I live just right over there.” I said. “Yes.” She said, seeming to recognize me. Totally normal request for a neighbor you just met, right??? Thankfully, it didn’t take long after this question to realize she had a delightful sense of humor, and she slowly began to open that screen door and come out to talk with me. 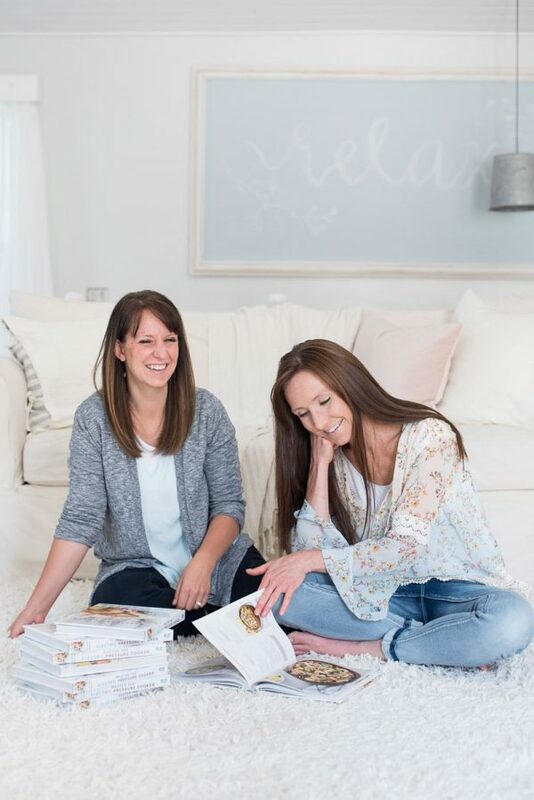 I went on to try to explain that I was a blogger, and liked to decorate and share, and even though she had no idea what I was talking about she amused me with laughter and her consent. She did try to apologize over the chippy paint in the windows, and the siding that needed to be washed, and probably began to really wonder at me when I insisted the paint and dirt was absolutely perfect. How even more delighted I was after she began to tell me the history of the 1905 home, and how she long admired it as a little girl growing up just down the road. 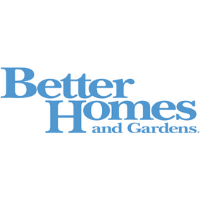 With the original plumbing, and no electricity upstairs, she had loved the home for years but found she couldn’t keep up with the repairs as she grew older. Perhaps my curiosity over her home surfaced her own courage to ask me something that she undoubtably had been wondering herself. 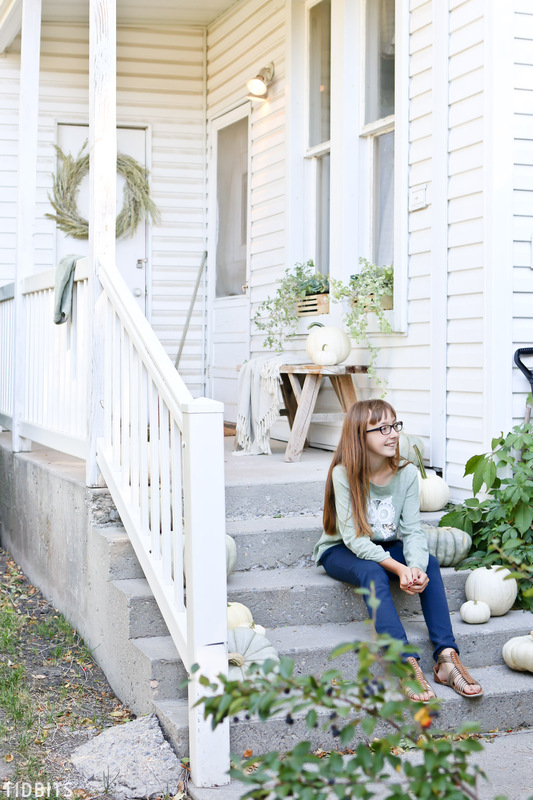 As the story continues, I had a hay day sprucing up this charming porch with my daughters and even more fun capturing the character of years gone by. She so perfectly left out her old broom and worn down door mat – obviously knowing I had a thing for old stuff. 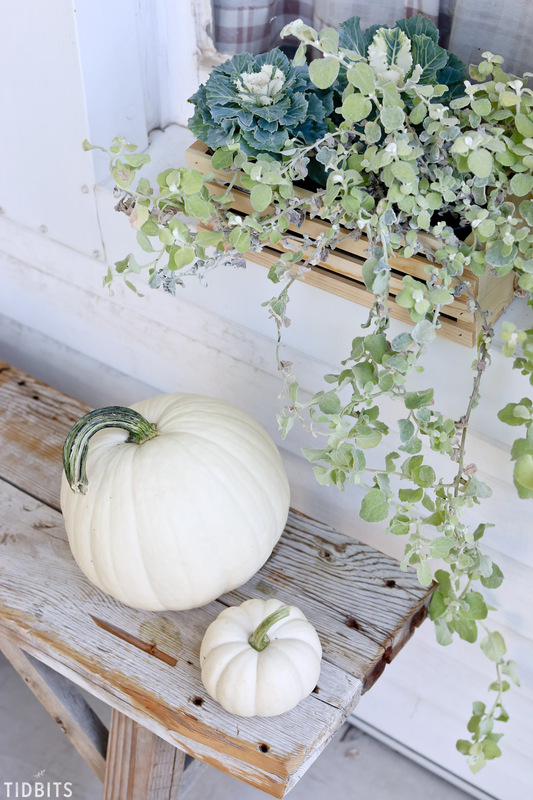 In the end, I did so much more than decorate a porch for Fall. I had made a friend. Let’s dive into a few details about the decor I used! It felt so natural for me to let the space do the talking, and this space was calling for neutrals and simplicity. 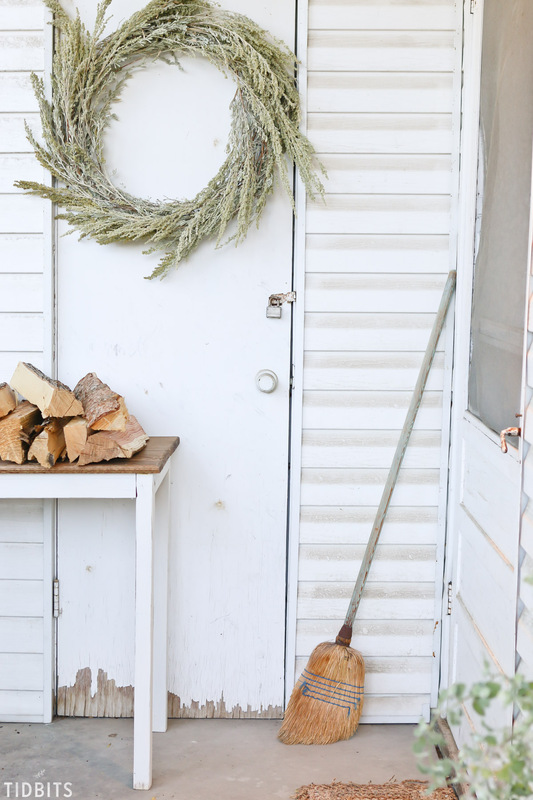 I mean, how awkward would an over-the-top, glamorous wreath from the craft store have looked on this old chippy door? 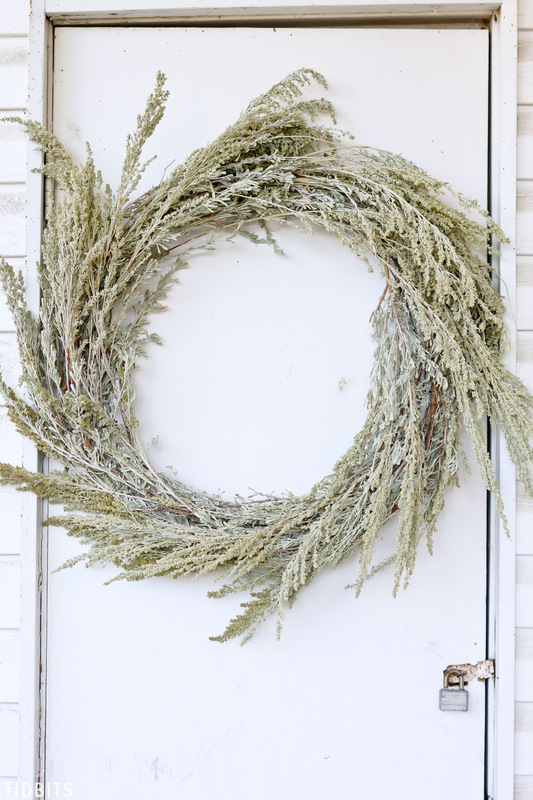 No – I opted to clip some branches from a sage brush and make a rustic and all natural sage wreath. It smells so good! 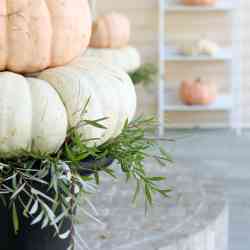 I happily found some sage green heirloom pumpkins and mixed them with white pumpkins. I rummaged through our furniture storage and pulled out rustic pieces my husband had made – a bench and table made from wood scraps. 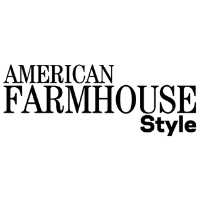 I imagined this old farmhouse kept warm on chopped wood, so I placed an easy to grab stash right by the door. Then I headed to the nursery to see what kind of Fall plants they had. To my delight, the plants were heavily marked down for the season and I snagged some flowering cabbage plants and vine-y licorice plants to fill her old windows. The small crates came from Walmart. It was my brilliant 12 year old daughters idea to place her sage green knitted sweater on the porch railing. 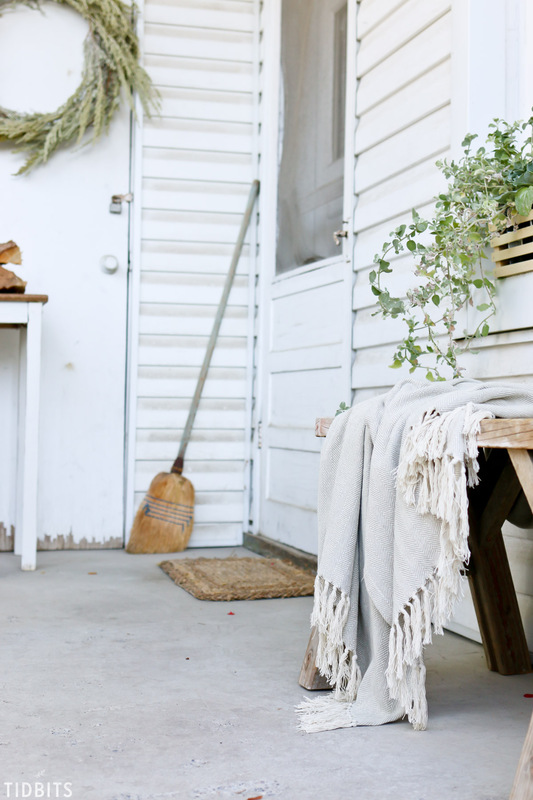 She is good at leaving her clothes all over the place, but it’s totally acceptable when it tells a story of a warm Fall day and a chilly Fall evening on the steps of a Farmhouse porch. 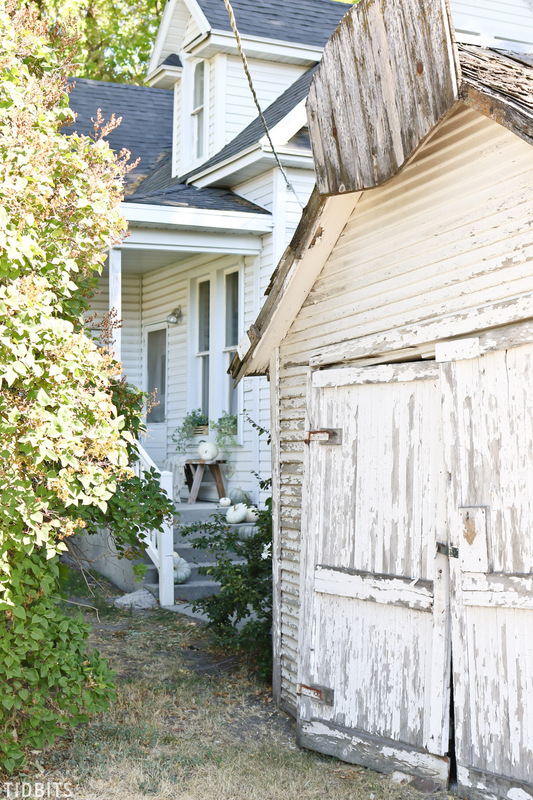 Perhaps my favorite part of this home is the old chippy paint garage. She stopped using it when the doors would no longer swing open during a particularly cold winter. Heaven forbid anyone ever have a notion to paint this perfection. 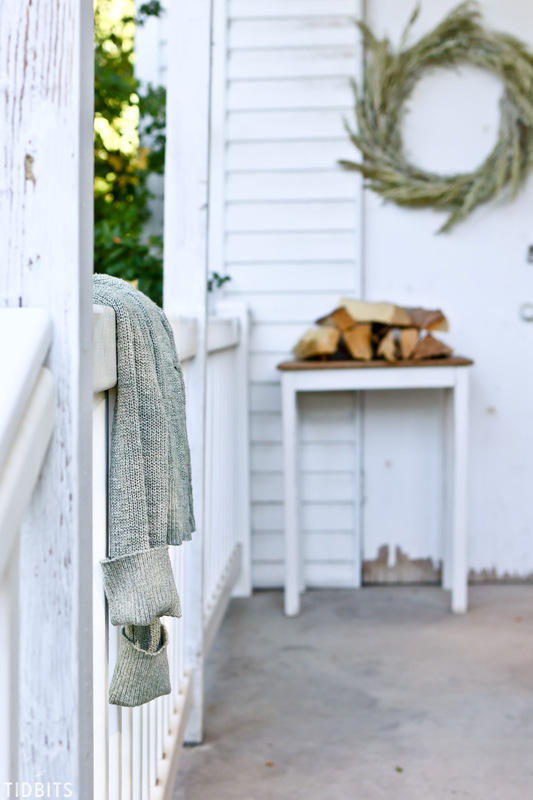 I may not be able to closely admire this decor in my everyday, but the joy I felt in meeting someone new, jumping way out of my comfort zone and creating a charming scene on a charming old porch was worth every second. Now if she would just let me peek inside her kitchen . 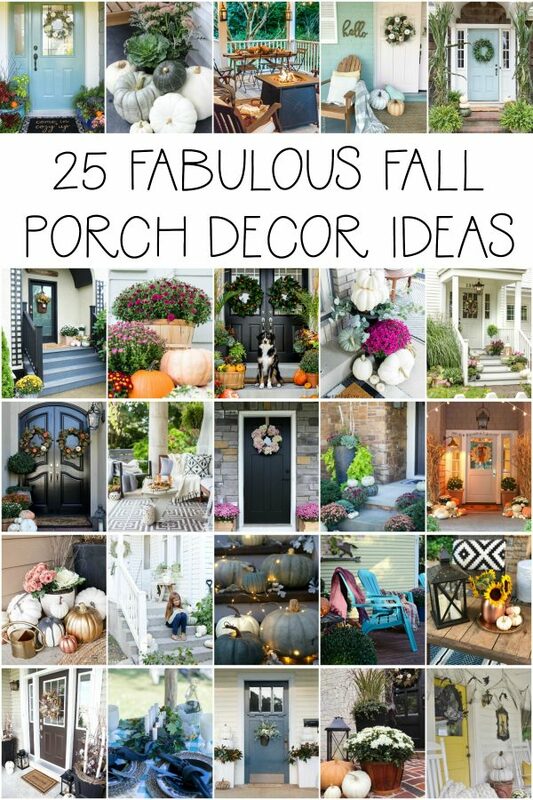 . .
Be sure to check out all these lovely Fall front porch decorating ideas. You will not be short on inspiration today! Thank you so much for reading my story! Now who here has an old home for me to play with????? Loved your story. I love old houses too. 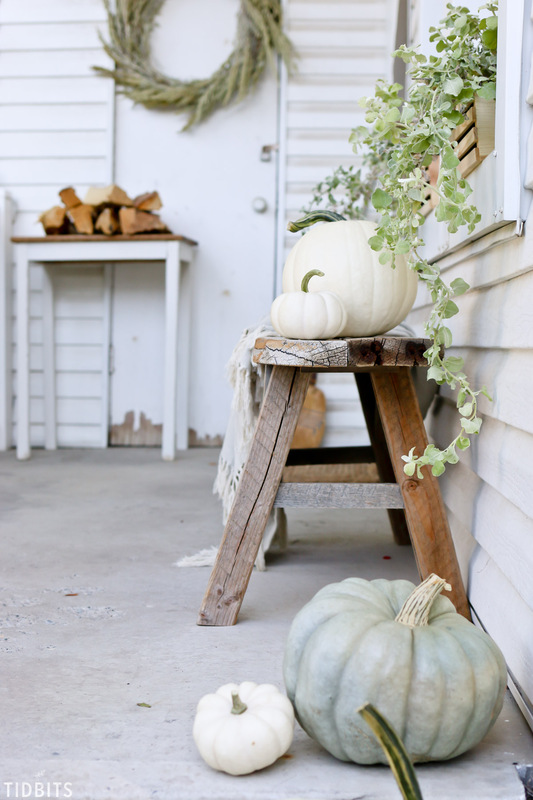 The porch is so pretty—love the colors! Thank you! So glad to hear! 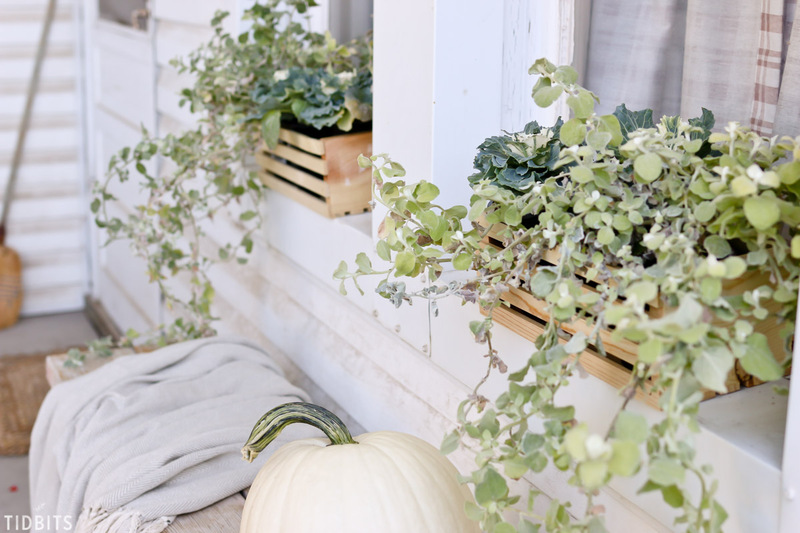 I adore her porch and how fun for me to decorate and get to know her! Thanks for your comment! Well done, Cami! 🙂 You and your girls are awesome! Everything looks great! Gaining a friend is the best thing. Yes, a new friendship was the best thing! Thanks for all your kind words! Great story! You not only decorated the old porch perfectly you bought joy to a new friend. So awesome! I think I got the most joy out of the whole deal. What a rewarding project! Thanks so much for your comment! She sounds absolutely delightful. And the porch is beautiful! Oh she was! So glad I got to know her. Sure appreciate your comment! All I can say is perfect.I love the job you did on the porch. I could stare at these pictures all day! Oh how sweet of you to say! It was a project I felt very happy to do, for so many reasons! Haha! Why thank you! I’ve always wanted to be a good egg 😉 . Thanks for your kind comment! I think it’s FABULOUS you took the initiative to go talk to your neighbor. And why not?? I’m sure she loves it and really appreciates the time and care you took. And how loved her porch looks now. Not only do you have a gift, but you gifted it to a new friend. Well done. I almost didn’t, that’s for sure! But so glad I did! 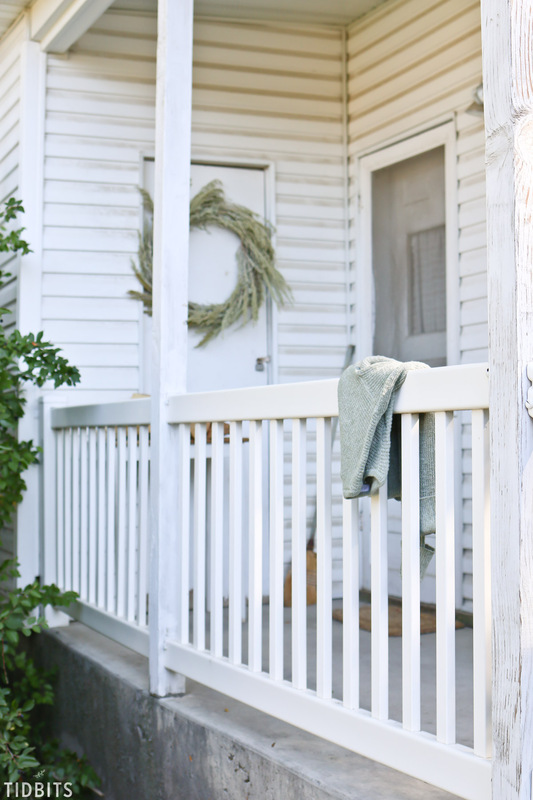 Charming porch, huh!? Thanks so much for your kind comment! Oh what a lovely, lovely story. Reminds me of when I had a neighbor knock on my door to ask about a plant I had growing beside the driveway…she and I became good friends, drinking coffee together and just talking. She passed away a couple of years ago but I remember our visits with fondness. 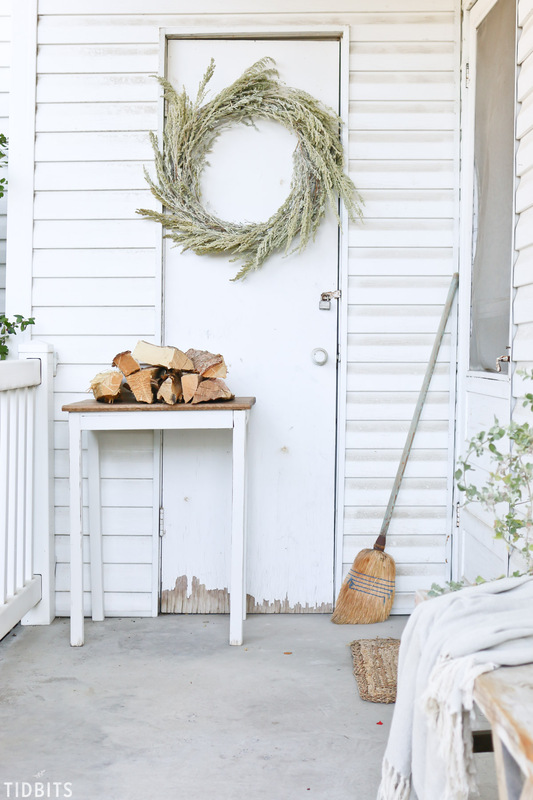 I love her front porch – you really captured its charm! Hmm, is a 30ish old house old enough? Come on down to Texas. 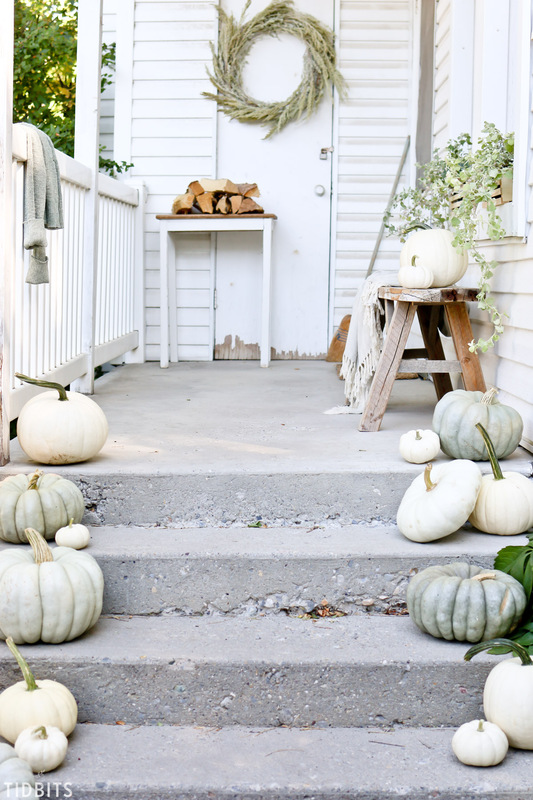 I’ll let you decorate my front porch! Lol. Oh I love that story Cecilia! Life can be so much richer when we find others to connect with and serve. I wish I could be your neighbor and talk over plants . . . among other things! XO! Oh wouldn’t that be fun! I’d love to talk plants and decor with you. We just might not get anything done though as we’d have so much to talk about! Hugs! Oh my goodness, Cami! That porch is beautiful but I really love the fact you made a new friend and your daughters were right there with you! Now, go make your new friend pumpkin bread and have a nice visit! You know, I was thinking of doing just that. I have to keep checking in to see when she wants me to take it all down. Good excuse, right?! Thanks for your comment! 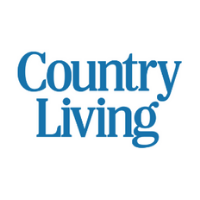 Jennifer @ Town and Country Living recently posted…Easy Outdoor Fall Decorations: Think Mums! Oh, I didn’t realize your house was that old! You do a beautiful job at capturing the charm! I couldn’t do it better if I tried! Thanks for stopping by and your sweet comment! I loved the story, and I am sure your neighbor enjoyed your enthusiasm and love of her house. Thanks for letting us visit your neighbor too. I hope she did! I told her I loved vintage style and she joked with me that I was calling her old. It was a very fun way to get to know her! 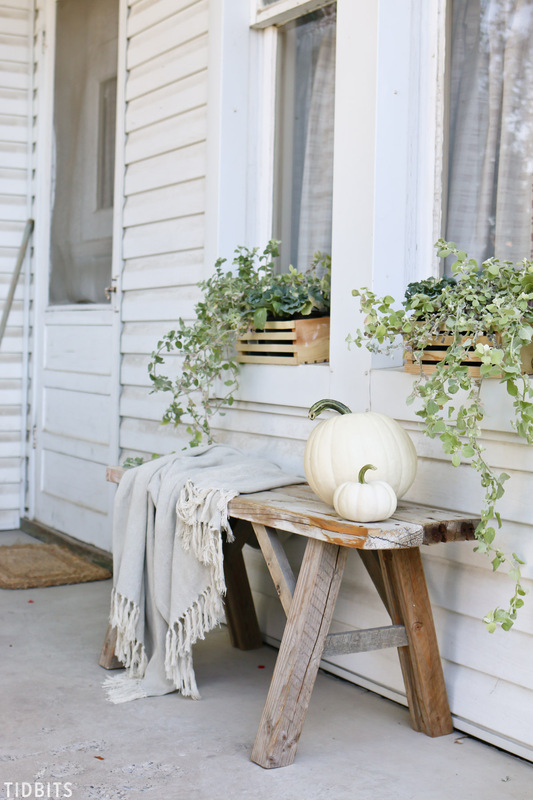 The porch décor is stunning! Love that wreath!! 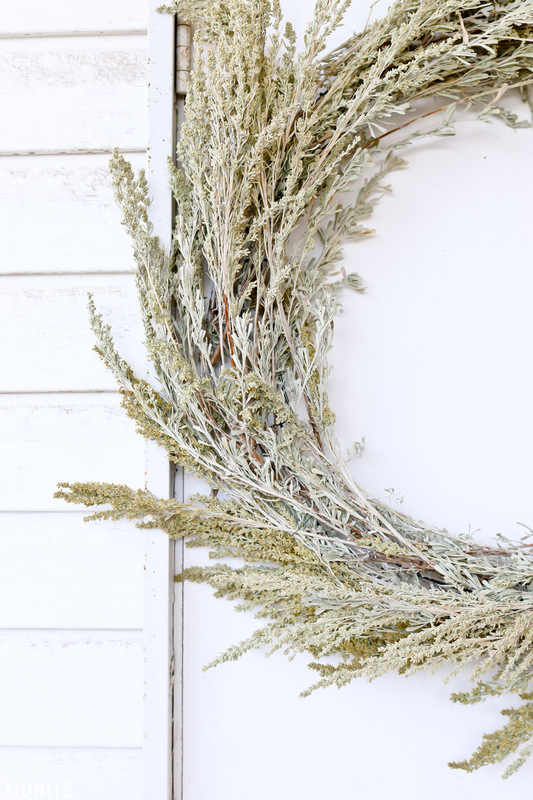 Why did I never think of creating a wreath from sage brush? It is definitely the only wild harvest material around us, and there is plenty of it! You are so adorable! 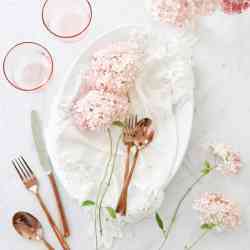 Love your simplistic, practical, down to earth style. I can just see that sweet lady sitting in a rocker on her porch surrounded by your loving touches. Wish I was your neighbor! I have hoped she would come out and sit and enjoy the beautiful weather. It doesn’t seem like she gets out much. She did mention it would be nice to have somewhere to sit out there. It’s been a rewarding project, for sure! Thanks for your comment! You made a new friend and decorated her porch , it looks so cute. Yes, so worth every second! Thanks for your comment Pamela! What a wonderful way to get to know your neighbor. I too love the chippiness of the aging paint and the story it can tell. I had a reader comment on my blog that if I repainted my chippy painted porch that my garden would look even better. I just laughed and accepted that we all have different taste. While I embrace the chippiness and think it makes the best accent others will think it distracting. I love how you kept it natural, simple and inviting. Any more and it would’ve overpowered the simplicity of the home. I had decided we didn’t need to know our neighbors, since we wouldn’t be here long. I quickly realized what missed blessings I may have had. Always worth getting to know those around you. Never know when needed service may be needed, both ways. That’s so funny someone said that to you. But it’s a good thing we are all different – things would be boring otherwise! Thanks for coming by. Happy tears, I hope! Hugs! Warm and cozy the story and front porch, that was a great time you had i know and that garage,wow. I would love to see the inside, kitchen and the room upstairs, that would be an adventure for the child in me, lol!! Oh, I am right there with you! My curiosity to see her house inside is killing me. But she mentioned to me that she had phobia’s, or she would invite me in. She is a tender hearted woman, but I can sure keep imagining what that old home may have in store! Thank you for your sweet comment! I want to live across the street from you. This story brought a tear to my eye. Now wouldn’t that be fun?! Thank you for your heart warming comment! hey girl- such a cool story! love the pics! 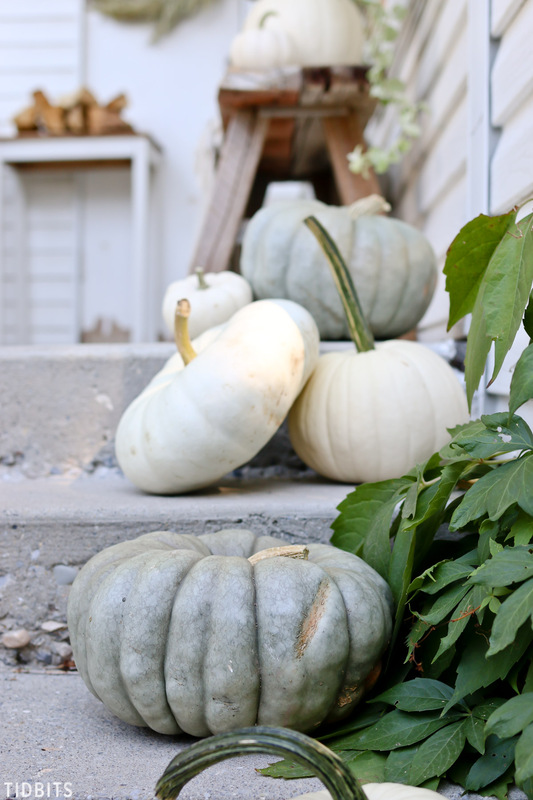 What a lovely story, you turned your neighbor’s porch into a Autumn gift! Love it! It was so much fun to do as well! Thank you for your kind comment! Loved your story and your generosity, plus I know you had a ball doing it! Looks great! Your daughter is picking up your talents and great ideas. You are a blessed and lucky mommy! This is my most favorite thing you’ve done. Anybody can do new, but it takes talent to make old look cozy and classy! Can’t wait to see her Christmas porch! (Those chippy garage doors are to die for). I about fell off my chair reading your comment! A favorite?! I’m so flattered! Thank you for making my day! Beautiful! I love your style and always look forward to seeing what you do. The neutral colors here work perfectly! Thank you Ashley! How very sweet of you to say! 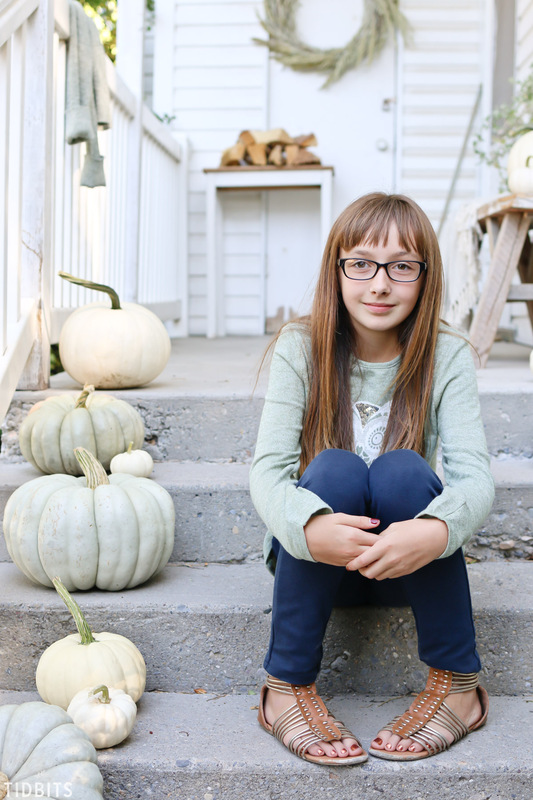 Great story, Cami… You never know what God has planned in the big picture of the life HE is planning! Praying for you still, as you continue to adjust to your new ‘temporary’ normal. Dear Julie! I’m so thankful for your prayers! God has been working many miracles in our hearts during this time and I am thankful for it, as hard as it may be. I just adore you! PS. That wreath is incredible! Oh Lucy! I love your kind and generous heart more! Thank you for your uplifting comment. Big ol’ hugs! Thank you sweet Rhonda! Oh I sure adore you! Aw! What a fun story! I love that you have the courage to do that…and I bet you brought joy to your neighbour, as well:) Truly thrilled to have you on this tour, Cami! Thank you Krista! Always an honor to be in your tours! And this is why I love you. What a GREAT story! That is so fun that you just walked over and offered to decorate! And she seems like she was so sweet about it too. Everything turned out so gorgeous– well done, my friend! Hope you’re having a great week! Oh sweet Abby! Thanks for your kind comment! She was sweet and I hope I can find a way to continue conversation. You made my day! I bet you would! 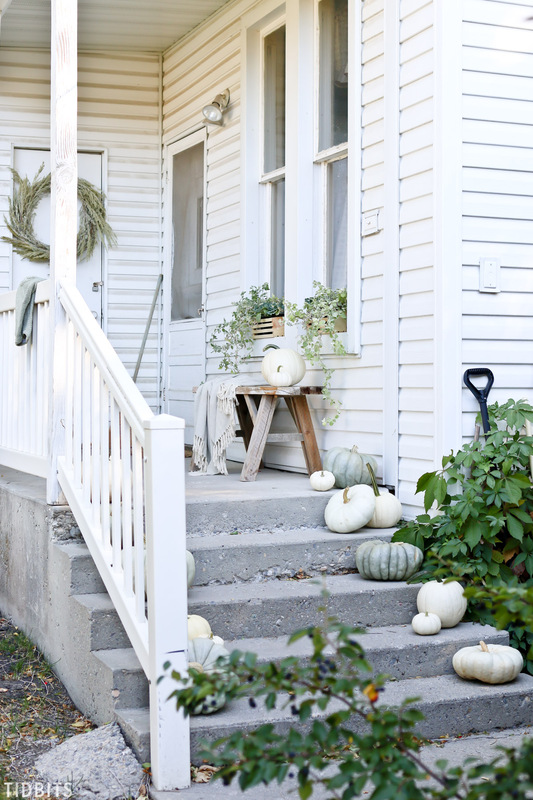 I mean, how can one resist such a cute porch! Thanks for coming by! I’m so proud of what you did! Not only are the decorations lovely, you made a friend and blessed her as well. Instead of being so frustrated with your rental, you vented in a way that is amazing by doing this decorating without destroying her dignity. I know it is not the holiday season but I imagine you have made hers. Thank you for sharing this story-I think it is one of your best yet! You know, I was so worried I would offend her by making her feel like she didn’t take care of her house. 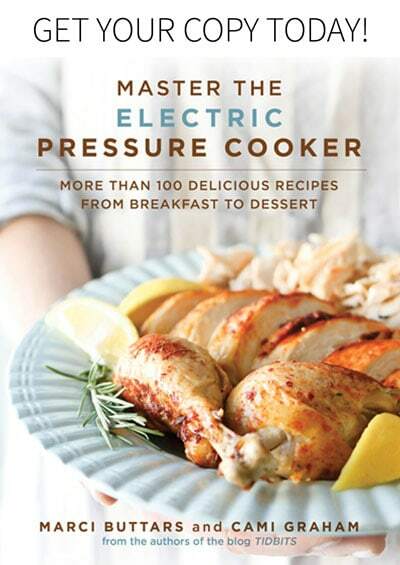 I stewed over that for some time after I had asked her. But I think it turned out to be an uplifting thing for her, at least I can sure hope so. Thank you so much for coming by and leaving such a kind comment! Here goes the waterworks! One of my favorite posts ever! What an inspiring story and porch! I LOVE that you used your talents and girls to help bring a little joy to a new friend. So inspiring. 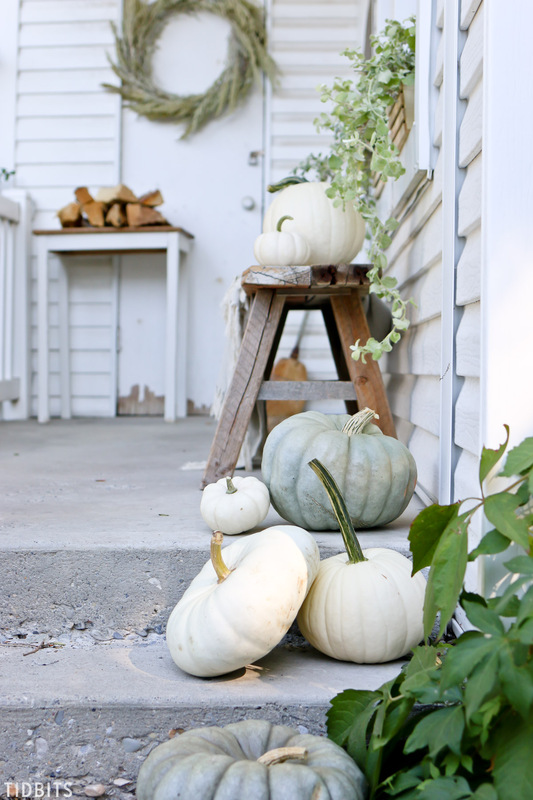 This is my favorite FALL Front Porch, not just because it is beautiful, but because of the love you shared!! ‘So excited to see what else you’ve done and will do. Thank you!! I think that was a sweet thing you did. And without upsetting her. You are in her life for a reason…or vice versa. And the porch looks very nice. And REAL. A story like this does everyone’s heart good. I don’t even know you and felt very proud of you for having the courage to go and knock at this woman’s door and doing what you did for her. I could even sense her cautiousness (is that a word?) wondering who you were and what you wanted and then, I’m sure, enjoying every moment and even having someone to talk to. It made her day! I would like to give you a big hug! How sweet of you! I hope you have visited your new friend often. Our elders are sometimes lonely and you and your girls are a delight to see coming for a visit I’m sure! Be sure to share what you do for Christmas! I love the outcome! Plus your generosity and courage. Keep it up! What an inspiring story.. You touched everyone’s heart in what you did. You are beautiful inside & out.. Thanks, Cami for this great information. Unique and impressive ideas and style also. Cynthia Walker recently posted…How To Install Wall Mounted Electric Fireplace In 5 Easy Steps? 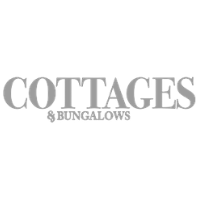 House stonework is a good way to add value to your home. and it looks good too.